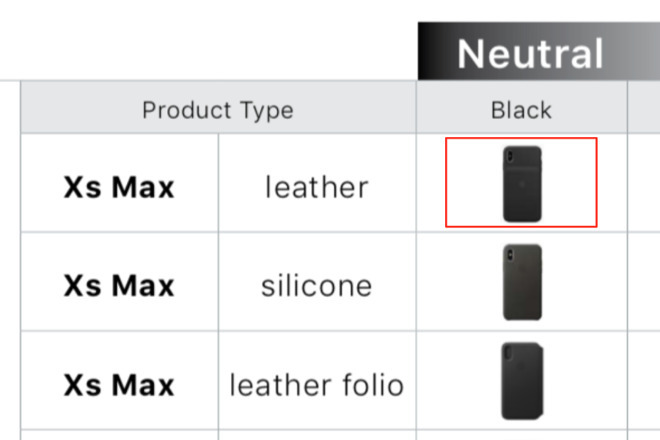 A merchandising guide intended for Apple retail employees features a range of iPhone cases including two with the distinctive hump of an extra battery. The guide was produced for Fall 2018 and contains no technical information surrounding wireless charging, and no other indication of the Smart Battery beyond thumbnail images listed as being for the iPhone XS Max and iPhone XS. 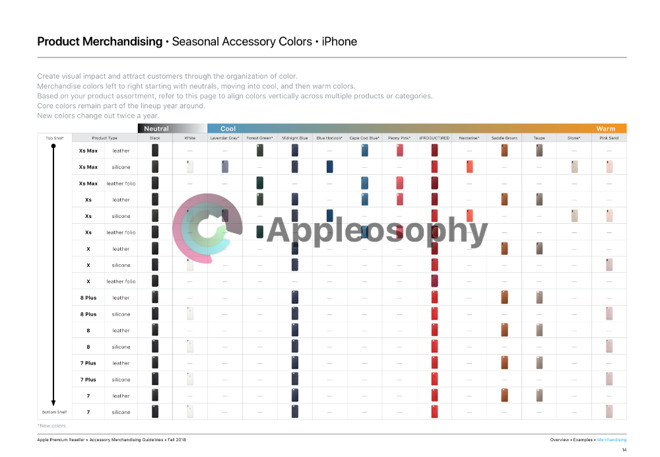 The leaked document first reported by Appleosophy is one page from a guide for Stores about both what Apple merchandise is available and how best to display it all. Some 96 different iPhone cases are shown with the instruction that they should be displayed in store "left to right starting with neutrals, moving into cool, and then warm colors." The two thumbnail images featuring a battery-style hump are both in neutral black. There does not appear to be a white Smart Battery accessory nor any for models but the XS ones. The leaked image is from page 14 of a document called "Premium Accessory Merchandising Guidelines Fall 2018" specially in a section called "Overview Examples." This suggests that the Smart Battery accessories were expected to be available at least approximately when the iPhone XS and iPhone XS Max launched. It seems unlikely that they will now be added before Christmas and the New Year. It's previously been believed that Apple was to launch three such accessories, not just two. This was based on part numbers and icons found within watchOS 5.1.2. In 2015, Apple released a Smart Battery case for the iPhone 6s which extended the life of the phone up to 25 hours. 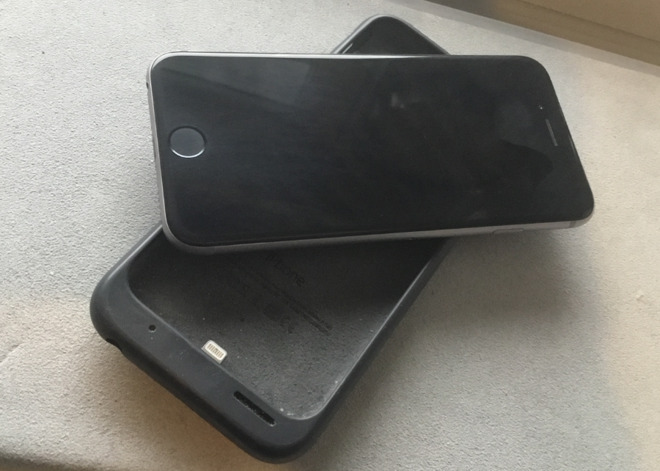 When you've charged both case and phone together, the Smart Battery Case depletes first so that your iPhone remains fully charged for as long as possible. This new leak appears to confirm that the new case will retain the 2015 model's hump but positioned lower down the case. The original design's shape was criticized for how it made putting the case on and taking it off an iPhone more difficult versus alternatives. One of the reasons my wife refused to give up to her 7 was that she lived the battery life with the battery case. Only when the 7 cracked was she reluctantly agreeing to a Xs. Battery life for the naked phone is clearly better but still not as good as with case. If this comes out we will be first in line to get one. Please apple take my money. Aren’t there other battery cases our there? The old case with the camel hump was such a fugly design I wouldn’t gone with it anyway. True, but I remember when the old case first came out there weren’t too many people keen on beholding it! I think the phrase is "Beauty is in the eye of the beer holder." There are more appealing designs than Apple's but maybe I could be convinced otherwise by some of Jonny's vain pontificating. The original design's shape was criticized for how it made putting the case on and taking it off an iPhone more difficult versus alternatives. Nonsense. People criticized the hump because didn't like the look. This case is probably the easiest case to take on/off that there is. I have one, and love it. You should try it. It fits my hand and pocket exceptionally well. Design isn't all about looks. Further thinking... the 7 and X battery cases I had were silicone, not leather. Another oddity. Rather unfortunate headline to refer to a battery case and "leaks" in the same line. Does anyone at AppleInsider even proof these stories? Not to quibble but might not want to put Battery and Leaks in the same headline. yeah this headline is pretty poor, I thought “leaks out” meant something else at first, too. Preplexing.. isnt it! everyone i know and every article i read ridiculed it.. and yet here we are. Good esthetics is core to Apples design philosophy. I haven't had a need for a battery case - my Spigen case is slim and functional for me, but yeah, the camel hump case worked find by all reports, but the design was pretty inelegant, if for no other reason than it made the phone thicker than it needed to be if they had distributed the batter over the entire back. especially odd since Apple focuses so much on how thin their phones are. To each their own, I guess. Actually, I'm certain that the shape was designed to better fit the hand. I have no doubt they tried the obvious alternatives with a thinner, edge to edge battery and decided that the shape they choose made more sense. Frankly, I'm surprised that they changed the decide to eliminate the lower "shelf" below the battery, having it go closer to the bottom. I find that that "shelf" is exactly where my pinkie lands and adds support while I'm holding my 6s. It seems like we lose that advantage with this new design. From what I understand, one of the things that made the Apple Battery Case so nice (but less aesthetically pleasing for some) is that the battery was put in such a place as to not interfere with the cell signal, which makes it a more power efficient case than others. Also, you could charge it via Lightning, which is always handy when dealing with iPhone accessories. Looks like Apple has potentially figured out a way to better balance the aesthetics of the new battery cases with the functional considerations of not interfering with cellular signal.